A friend posted on my Facebook page this week asking for thrift styling advice. 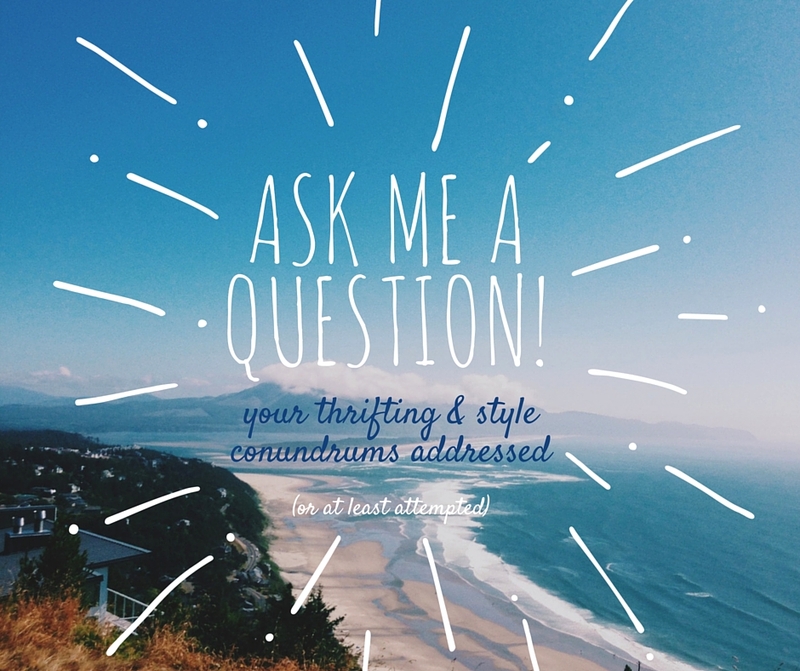 She mentioned it would be great to have an “Ask Leah” feature where readers could send in queries re: thrift store strategy and thrifting dilemmas, how to style your thrift finds, how to make the most of your closet on a budget… anything to do with thrifted style! So send me an email at leah at thriftshopchic dot com and I very well may feature your question in a post. Pictures happily accepted but not necessary. Happy Weekend already–is it just me or has this week been a looooong one?? What is your favorite clothing purchase (from a Thrift Store) and why? Kathleen–see today’s post for an answer to your question. I’d love to hear what YOUR favorite clothing thrifted find is! Thanks for the question. Question: how do I improve my wardrobe stylistic sense? Ooh, fun question!!! This will make a great post. Quick clarifying question–are you talking style in your play/fun/home life, or style in your work life? Since you mentioned the two wardrobes don’t really overlap. Well both, but more for work. That’s where the wardrobe is more important for me.